We previously brought to the attention of our members the Conservation Project for the preservation of three important and irreplaceable Schwenkfelder documents held by the Schwenkfelder Library & Heritage Center. 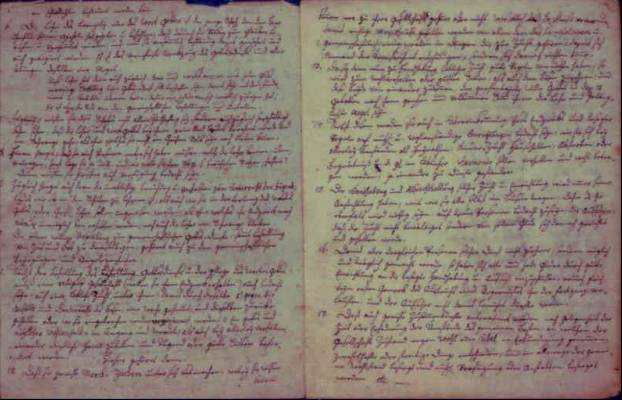 · 1764 Articles of Agreement establishing the Schwenkfelder school system. Many Society members stepped forward and the Conservation Project raised about $3,000 for which the Schwenkfelder Library & Heritage Center is most appreciative. Your help provided the means to preserve these three documents, which were in need of stabilization and conservation. The Conservation Center for Art and Historic Artifacts in Philadelphia, a regional center for the conservation of paper artifacts, has cleaned the documents, removed damaging adhesives, supported areas of rips or tears to avoid further damage, and mounted the documents on acid free supportive mat board with windows for viewing. All three documents are now back at the Schwenkfelder Library & Heritage Center preserved for future generations. The 1734 Ship’s Passenger List, St. Andrew, Capt. 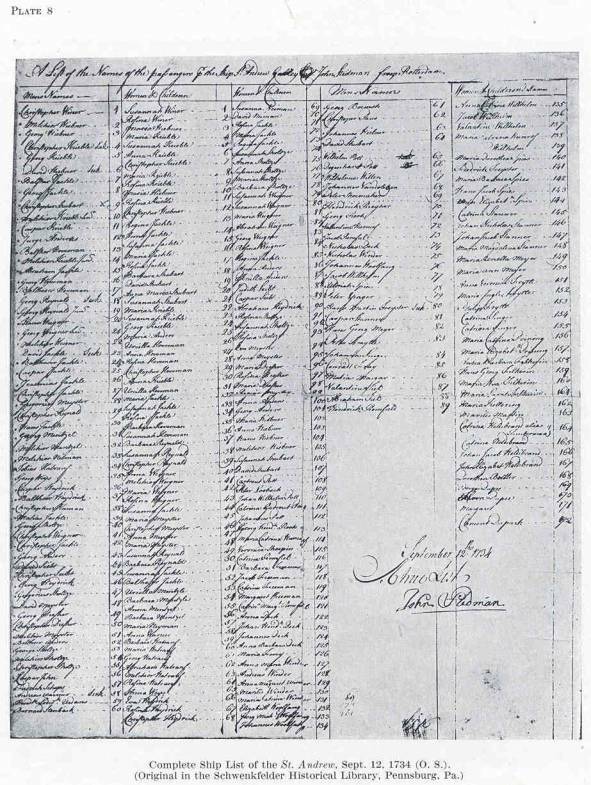 John Stedman, lists passengers, both Schwenkfelders and Palatines, traveling to Philadelphia from Rotterdam. The list divides passengers by men in one column and women and children in another. It contains the names of the 180 Schwenkfelder immigrants fleeing Saxony for refuge and religious freedom in Pennsylvania. The St. Andrew left Rotterdam, Holland, on June 20, 1734, and arrived in Philadelphia harbor the 22nd of September, 1734. The Oath of Allegiance to the King of England, September 12, 1734. The 1734 Oath of Allegiance was a required document of the British Crown. All males, 16 years of age and older, had to pledge their allegiance to the King of England, affixing their names or “mark” to the document as proof of their pledge to obey the laws of Great Britain. 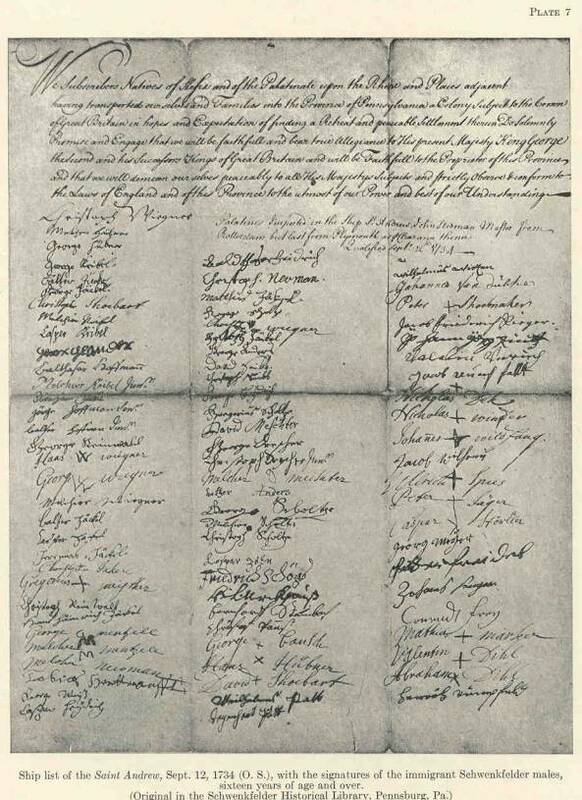 Nearly all Schwenkfelder men were able to sign their own name, providing us with signatures of those able to write. Included with the rationale for having the school system was the practical organizational structure such as trustees and their authority, election of teachers, investment of school funds and even a stipulation that should the endeavor fail, provision would be made to bring the effort to a close and restitution made to all contributors or their heirs. A full translation can be found in The Schwenkfelders in Pennsylvania by Howard W. Kriebel, 1904. The 1782 Articles of Agreement forming the Schwenkfelder Society began many years before the 1782 signing date as the immigrants began discussing formation of a church or church organization. Following many years of discussion, Rev. Christopher Schultz penned the Articles of Agreement and 41 families subscribed to the agreement to form a Society of Schwenkfelders using as its model the Society of Friends. This document was the formal agreement of the Schwenkfelders, along with various Bylaws periodically adopted at meetings of the full Society, until 1851, when a Constitution and Bylaws based on the Articles of Agreement was printed by Rev. Joshua Schultz. The formal incorporation of The Schwenkfelder Church did not occur until 1909. It has been determined that the 1782 Articles of Agreement document is already in proper acid-free preserved storage.